Last Minute Products for "Fill In" Sales! Spring has sprung and it's time to fill those holes in your production where you have extra greenhouse space. There's still time- but barely. We call this part of the season "quick turn" because any product ordered now needs to finish FAST. 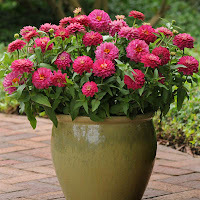 Look at zinnias as your first "go to" for a quick turn crop. They are quick, easy germinators and rapidly reach a transplantable stage. Grow in flowering jumbo packs of 4" pots, and expect to move them out within 10 weeks! Bedding-type series Magellan and Dreamland are the most popular, followed by the Zahara and Profusion series. Double Strawberry Zinnia Zahara pictured left. Other seed annuals that move quickly at this time of year include dwarf pot sunflowers such as Sunny Smile or Rio Carnival. 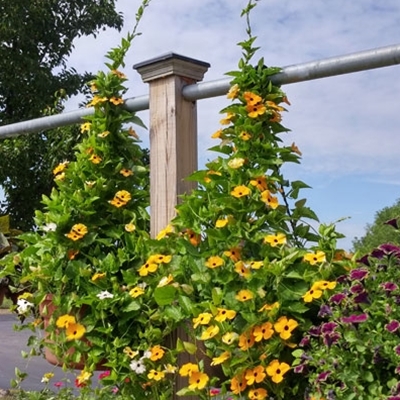 For quick sales, Thunbergia Spanish Eyes, Alata Mix (pictured right), and Blushing Susie finish fast even when grown in a trellised pot. Although we don't recommend this for your entire production, placing last-minute orders using our plug & liner grower specialists' availability lists is an excellent option to fill in your production. Quick turn products are grown in larger cells, allowing you to transplant them into pots and baskets just prior to retail sales. Four Star- SuperNova® 28 annuals and 42 annuals. Check availability. Pleasant View Gardens- Fast Tracks™ annuals. Browse available trays. 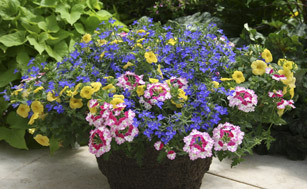 Barone Gardens- Grow and finish combination baskets and containers quickly and efficiently with KwikKombo® multi-liners grown in our newest supplier's economical 17 Strip Tray! View availability. Be sure to check each supplier's ship week availability, then call Harris Seeds at 800-544-7938 to place an order. Grow Creative with Sunny Succulents! Copyright © 2016 Ornamentals News |Designed by EZwpthemes |BloggerTheme Converted by BloggerThemes.Net and BizWonk.